In addition to the three connector types already defined in previous versions of the HDMI standard, the HDMI 1.4 specification introduces a new "Type D" connector designed for cell phones, pocket cameras, and other portable devices where space is at a premium. 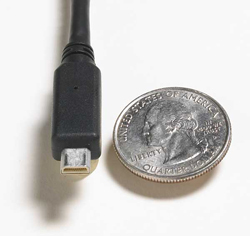 Roughly the size of a Micro USB connector, it packs all the power and functionality of an HDMI link into a tiny form factor. Featuring a full nineteen-pin array like other HDMI connectors, the HDMI Micro Connector can handle video signals up to 1080p, bringing state-of-the-art HD resolutions to the realm of handheld devices. This new connector is approximately 50% smaller than the size of the existing HDMI Mini Connector.